After the first excitement of getting engaged, then comes the realisation that you actually need to start planning a wedding. One of the best ways to stop all those thoughts racing around in your head and keeping you awake at night is to step back, take a deep breath and use a Wedding Checklist. We have created a comprehensive ready-made Wedding To Do List for you which you can easily amend and add to if you wish. Obviously the timings will depend on when you actually get engaged, but the sooner you start on your Wedding Checklist, the better. There are quite a lot of stages below so if you prefer you can download and print the condensed version of our Wedding Planning Checklist. 1. Set your budget – This is probably the first thing you need to decide – probably the most vital item on your Wedding To Do list , as all your wedding planning will depend on this. You need to know who is contributing (if anyone) and how much. Read our other tips on how to save money on your wedding budget. 2. Set the date – After setting the budget, you can set the date; remember an off-season wedding will be less expensive than one in high season. 3. Research venues – Venues sometimes get booked up a long time in advance so the sooner you can decide and book the better. 4. Decide your bridal party – You need to discuss with your fiancé who will be the best man, groomsmen and bridesmaids, flower girls, and ring bearers if you decide to have them. You will need to consider your budget as a bigger bridal party means more expense. 5. Research suppliers – Ask friends for recommendations and visit wedding fairs to find photographers, florists, wedding dressmakers and any other suppliers you will need. 1. Start the guest list – Again consider your budget and discuss with your fiancé and maybe family. 2. Start a ‘style’ folder with ideas and things you like – There are plenty of magazines to give you inspiration or you can do this online with something like ‘Pinterest’. 3. Book your venue – Another vital item on your Wedding Checklist. Have an initial discussion as to what they are able to provide and whether they have their own preferred suppliers which can make things easier. 4. Book your celebrant – Like venues, celebrants often get booked up early, so the sooner the better. 5. 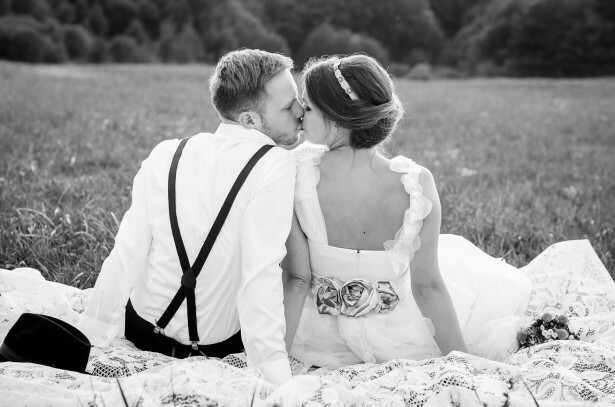 Take out wedding insurance – When you consider the immense cost of a wedding, this is probably a good idea just in case the wedding needs to be cancelled for whatever reason. 6. Order/make and send ‘Save the Date’ cards – These can be sent later but sending these out early will allow guests more time to think about whether they will be able to attend on that date and make arrangements for accommodation or book time off work, especially if you are having a destination wedding. 1. Choose your colour scheme – This may need some discussion with your bridal party. 2. Start to book suppliers – Consider a photographer, videographer, florist, DJ, band, ceremony musicians, cake maker, transport, and caterers if necessary. 3. Establish your fitness regime – If you intend to lose a few pounds before the big day, now is the time to start. 1. Buy the dress – One of the most exciting parts of your Wedding Checklist! You also need to schedule your fitting appointments, your first should be as soon as the dress is finished, and the last no later than three weeks before the wedding. 2. Meet with caterers – If you are having separate caterers you will need to decide on your menu and maybe organise tastings. 3. Sign up with a gift registry – This may be the easiest way for your guests to buy presents for you. 4. Set up your personal wedding website – This is a great way to keep guests informed and you can post all your wedding details on here. There are free websites where you can do this. 5. Draw up a payment schedule – You need to manage your budget and make sure you don’t miss any vital payments to your suppliers. 6. Book hotel accommodation – You may want to book the bridal suite at a special hotel or at the venue. 1. Organise invitations and thank you cards – You can order, buy or make your own. 2. Order or buy bridesmaids’ dresses – Don’t forget to think about the accessories. 3. Meet with your celebrant – You will want to discuss the order of the ceremony and what you expect. 4. Book remaining suppliers – If you have the luxury you should aim to have all your suppliers booked by now. 5. Start to draw up an itinerary for the day – Include everything from when you have to get up, to the time when the day will end and who should be where when. Don’t forget to schedule hair and make-up and any deliveries. You will need to amend this as you go along. 6. Buy your accessories – Headdress, shoes, jewellery, and underwear. 7. Discuss hen/stag parties – Many couples choose to go away for this so you need to allow plenty of time for organising and booking. 8. Choose attire for groom and male bridal party – It is normal to hire this so you will need to select a supplier and schedule in fittings for everyone. 9. Research wedding day hair and make-up – You will also need to discuss your bridesmaids’ make-up as you will want them to blend in. 10. Check your gift registry – You may want to update your list. 1. Book your rehearsal and dinner – It is not essential to have a dinner but it is a nice way for the bridal party to get to know each other if they have not all met before. 2. Check invitations – Chase up the printers if necessary. 3. Choose your music – This will depend on what type of ceremony you are having and you may want to draw up a shortlist for discussion with your fiancé. 4. Book final suppliers –This is really the very latest you should have your main suppliers booked if possible. 1. Meet with celebrant – This will be when you finalise all your details and hand over your ‘Notice of Intended Marriage’ form. 2. Finalise your readings – Make sure whoever is performing any readings is comfortable with what you have chosen. 3. Organise order of service sheets – You can get these printed or it is easy to make your own. Your venue may also provide these. 4. Finalise menu – You will need to meet with your venue or caterers to make your final choice. Use this opportunity to clarify exactly what the venue is offering. 5. Finalise flowers – You will need to make a final choice around your chosen colour scheme. 6. Organise speeches and toasts – Make sure that everyone in your bridal party knows what is expected of them. 7. Finalise your ceremony order and reception – You may need to adjust your itinerary. 8. Send your event order to your suppliers – You can also add the details of your contact person for the day who will deal with any problems. 9. Buy your rings – Make a special day together. 10. Buy final extras for ceremony and reception – You may want to consider a ring pillow, special toasting flutes, a guest book, favours for guests, gifts for bridal party. 11. Start to try out hair and make-up – Schedule appointments with your trusted hair dresser and choose a recommended beautician. Check out our timeline for bridal wedding preparation. 1. Double check ‘Notice of Intended Marriage’ form has been completed – You will obtain this from your Celebrant. This must be submitted to your celebrant no later than one month before the marriage. The marriage cannot take place without it. 2. Review all suppliers – Go through your list of suppliers to make sure everything is on schedule. Draw up a list of any outstanding queries and arrange a meeting if necessary. 3. Send out your invitations – You will need to set up some system for tracking RSVPs. 4. Confirm your honeymoon travel arrangements – Double check all bookings and payments. 5. Work out your receiving line order –There is plenty of information available on the etiquette of your receiving line at the reception. 6. Something old, something new………. – If you want to be traditional you should decide what you will wear to fulfil the custom of ‘something old, something new, something borrowed, and something blue’. 7. Schedule and book all remaining hair and beauty appointments – You don’t want to leave this till the last minute to avoid disappointment. Also consider a pampering spa treatment. 1. Confirm final guest numbers – You may need to chase up anyone who has not yet replied. 2. Arrange final dress fitting – Take with you the underwear you will be wearing on the day. 3. Check arrangements for the rehearsal dinner – Don’t forget to remind your bridal party. Finalise all arrangements with the wedding party and give them all a copy of your itinerary. Give the best man and chief bridesmaid contact details of all suppliers. 4. Start organising receipt of gifts – Arrange for safe storage and transport to the venue if necessary. Record who sent what and write thank you notes as gifts arrive. Arrange for these to be posted after the wedding. 5. Confirm all times with suppliers – It is a good idea to send them copies of your event itinerary. 6. Confirm all final payments – Make as many payments in advance as possible and schedule/organise any remaining payments. 7. Finalise your seating plan – Draw this up on a large piece of card to display at the venue, if the venue is not organising this for you. 8. Write your vows – If you are making your own vows, now is the time to write them. 1. Give final guest numbers to your venue – Double check all details and meet with them to finalise any details and sort out any outstanding queries if necessary. Check out our other post to see what else you should finalise with your venue. 2. Delegate wedding day and post wedding day tasks – You may need someone to look after the gift table, children’s packs or guest book. You may need to organise the return of suits and any rentals or get your dress cleaned. Delegate someone to be in charge of timings during the day so they can check you are on schedule and that everyone is where they should be on time so that you can relax. 3. Start to wear in your shoes – It’s a long day, so you want to be comfortable. 1. Collect your dress – Have a dress rehearsal to make sure all your accessories go together. 2. Pack for your honeymoon – You may be on a tight schedule after the wedding, so think about this beforehand. 3. Have your last hair and make-up trial – You should now have a firm idea of your make-up and hairstyle. 4. Arrange for extra items to be dropped off at venues – You may be providing some things yourself e.g. seating plan or items to keep children entertained. 5. Prepare a wedding day emergency kit – You may want to include anything from safety pins to a spare pair of tights. These are available to buy ready made up or you can make up your own. You will need to delegate someone to take care of it. 1. Attend to any last minute beauty tasks – Get your manicure done, pluck any stray eyebrow hairs. 2. Layout your dress, underwear and all accessories – Getting ready will be more enjoyable if everything is to hand. Don’t forget your perfume. 3. Check in with bridal party – Make sure they are all prepared and that the best man has the rings! 4. Relax, have a long bath and get a good night’s sleep – It may be tempting to go out and enjoy a last night out, but you do want to look your best tomorrow. 1. Eat a good breakfast – Arrange beforehand for someone to prepare your favourite breakfast for you so you are more likely to eat it. You will need lots of energy to sustain you till the reception and drinking champagne on an empty stomach is never a good idea. 2. Allow plenty of time for getting ready – Getting someone to help you dress will help to keep you calm. 3. Relax and enjoy your day! So there you have it – your comprehensive Wedding Checklist to plan the perfect celebration!